Heat oven to 400ºF. Grease rectangular baking dish, 11x7x1 1/2 inches. Cook beef and onion in 10-inch skillet over medium heat, stirring occasionally, until beef is brown; drain. Stir in gravy mix (dry), water and mushrooms. Cook 1 to 2 minutes, stirring constantly, until thickened; remove from heat. Stir in sour cream. Spoon mixture into baking dish. Stir Bisquick™ mix, milk and egg until blended. Spread evenly over beef mixture. Top with bell pepper rings. Bake 18 to 22 minutes or until topping is light golden brown. Let stand 5 minutes before cutting. Did You Know... Stroganoff is named after a 19th-century Russian diplomat named Count Paul Stroganov. Traditional stroganoff is made with thin slices of beef tenderloin and served over rice or egg noodles. Serve With Round out this meal with a fresh-fruit salad from the deli. 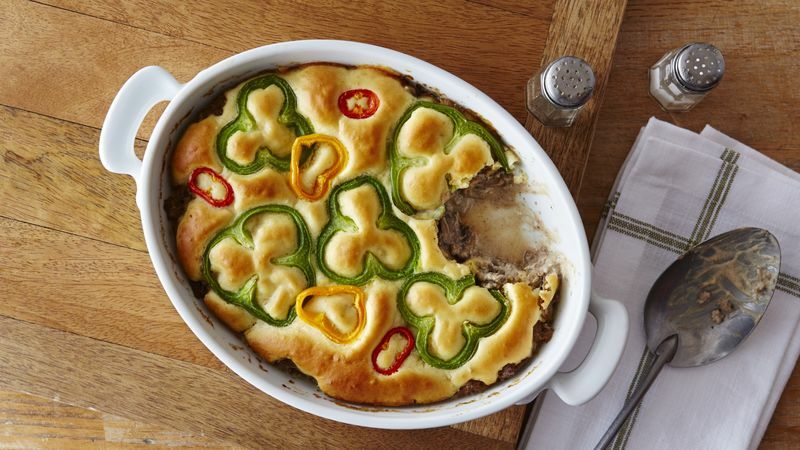 Substitution The next time you make this casserole, omit the green pepper rings and sprinkle the topping with paprika.